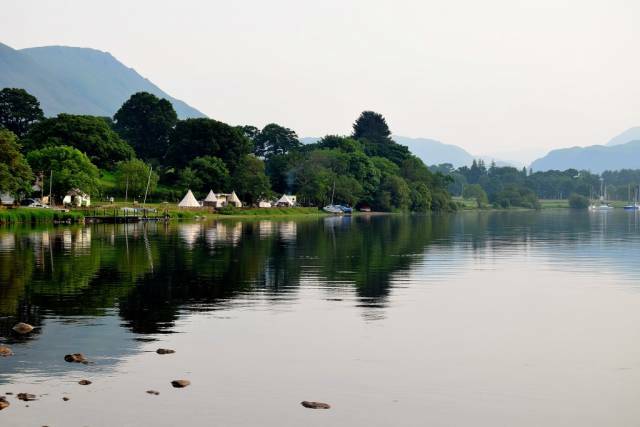 Waterside House Campsite has long been established as the ultimate ’under canvas’ lakeside retreat on Ullswater. Due to high demand for our lakeside tipis, we have decided to rework ‘The Garth’ as our Glamping village. 2017 will see the addition of 6 pods, all within a stone’s throw of beautiful lake Ullswater. The Pod is a timber built, insulated hut designed to be used just like a tent but unlike a tent it is already set up on the site, ready for you to move in! All you need to bring is your camping gear – minus the tent. With no tent to erect or pack away in the rain your holiday could just have become a lot less stressful. Our Pods will have lambs wool insulation so you can keep warm and visit when the colours and seasons change in the Ullswater Valley. The Pods are completely empty on arrival. They also have the added benefit of lighting, heating, a black out blind, laminate floor and a barbeque area positioned just outside so you can enjoy the amazing views whilst having a spot of lunch or take advantage of our other campsite facilities which include cycle hire, boat hire and the campsite shop. Each Pod has plenty of headroom and a floor area of 3.0 metres by 5.0m metres – ample space for a family of 4. What does it cost? One night’s Pod camping costs from £55 to £70 per Pod. Our prices are based on 2 adults sharing. Unfortunately, we are unable to accept dogs in the Pods, sorry. * No wrestling with tent poles, just move in. * No waiting for the weather to dry the tent out before you can pack up and leave. * Insulated and noise proof! * Warmer during those unpredictable springtime evenings. * Heaters included in the price, mains light and a power point for charging phones, etc. * Affordable accommodation in arguably the most stunning location on the lake. For further enquiries please email us or book online.